Looking for a Maya production pipeline solution that artists can use? Tired of spending time trying to track down a specific version of a file? Sick of struggling with the mundane tasks of organizing Maya animation projects? Plumber is an easy-to-use asset-based production system that will become the foundation of your small studio, commercial project, or student work. Written by an experienced Maya artist, Plumber is designed to be an intuitive and user friendly system of tools. This simplicity of use, however, hides a deep production system that will grow with your needs. Your projects will be organized, efficient, and completed in record time. Completely GUI based, Plumber's simple and intuitive tools let artists work efficiently. Work collaboratively with shared asset libraries, simple department switching, and concise shot management tools. An asset-based system, Plumber automatically organizes models, puppets, characters, sets, and props. Easily integrate pre-existing tools, unique procedures and custom scripts into the Plumber system. Perfect for students, Plumber utilizes big studio pipeline methods you will not be be exposed to in school. Written by an artist for other artists, Plumber is completely GUI Driven. Easy to learn interfaces will allow you to control a powerful production system with mouse clicks, not shell scripts. For students, and others not exposed to a production pipeline before, Plumber is the perfect introduction to working according to studio proven methods. While the learning curve is quick and the workflows intuitive, as you learn more about the way Plumber works, you will realize just how deep the system is. Plumber provides the power and control of an Asset-Based production system. With automatic versioning, notes and file naming, you will never misplace another file. The Asset Library allows you to categorize all the Characters, Props and other assets of your production -- complete with reference images of each Asset. 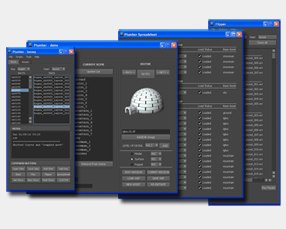 Plumber allows for both Linear and Parallel Asset creation workflows, providing maximum flexibility for your production. Set Assets, a powerful organization system, allow for multiple assets to be grouped together for convenience and efficiency. Variable asset Levels of Detail (LOD) allow for simplified asset versions, or multiple costume changes. While Plumber provides a turn-key frame work for production, there are multiple ways to seamlessly integrate your tools and procedures. The Plumber Scripter allows you to bring in tools production-wide, without artists having to reboot, close Maya, or even reopen the GUI. Global MEL variables provide the hooks into the Plumber system to allow you to build your own custom modules and tools, while user defined scripts allow you to add custom features to almost any Plumber task or command. Plumber is ideal for projects with artists networked together. With a shared Asset Library, and accessible production files across all departments, every member of the production team can easily pass along their completed work. For project teams on non-networked systems, Plumber's directory-based production structure allows for work to be easily copied and passed along via ftp or email. You need not sit together to work together. Shot work is broken up by departments that are specified by User-Set preferences. While each department is a Maya project and Workspace, the Shots GUI provides automatic naming and versioning. With the Reference-based Asset system, files are small and save quickly. Playblast generation is automated, and linked to specific file versions. User preferences determine show-wide settings for Render and Playblast resolution, ensuring consistency across all departments and artists.